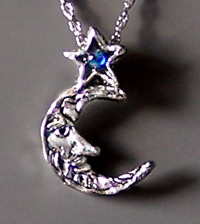 The clasit "Man-in-the-Moon" with bushy eyebrows, mustache and beard, topped with a crystal-accented star. We make it by hand from lead-free pewter. Like all our necklaces, it comes on a chain.